Keep your favourite BIRKENSTOCK sandals in the wardrobe for longer by styling them with socks. With our soft, skin-friendly socks combined with our original footbed, you can enjoy the comfort of your sandals all year long. One of our favourite ways to wear them is with our classic BOSTON WOOL FELT clog. Made with 100% natural, high quality sheep’s wool, these will deliver the warmth and comfort you need in the colder months to come. Pairing up with ARIZONA allows you to explore in your favourite summer sandals for longer. With a variety of socks to choose from, you can give feet a different look every day with the same sandals. Get cozy in these soft, skin-friendly cotton socks. Made with comfort in mind, a pair of these socks are the perfect way to lounge or snug in your favourite BIRKENSTOCK sandals. Share your best Birkenstock & Sock style and be in to WIN 1 of 6 pairs of Birkenstock sandals and socks! 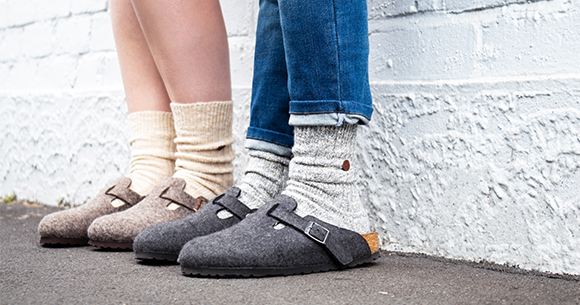 Simply follow @birkenstocknz, share your best Socks and Sandals style , and tag #birkensocksnz Check back every Tuesday to see if you are a winner!